The Entrepreneur’s Weekend, organized by the ITU Tech Entrepreneurship society, was successfully held on Saturday June 28th. The day-long event was organized around participants pitching different business ideas. The event kicked off with Mr. Rana Saifullah, a Business Development Manager at Centsol Pvt. Ltd. briefing attendees about the rules. 36 brilliant ideas were then pitched by participant teams within the first hour of the event. These were divided into two categories for further evaluation; Undeveloped (without prototypes) and Developed (with prototypes). A further 13 of these pitches were shortlisted by the panel of judges, which included ITU faculty members Dr. Adnan Noor Mian and Dr. Saeed ul Hassan, Mr. Sami Khan, the Director of ITU Trainings, Ms. Samia Razaq, the Co-Director of IPAL, Mr. Rehan Shay’kh, a mentor at Plan9 Tech Hub and Mr. Tanzeel-ur-Rehman, the COO at Virtual-Force. 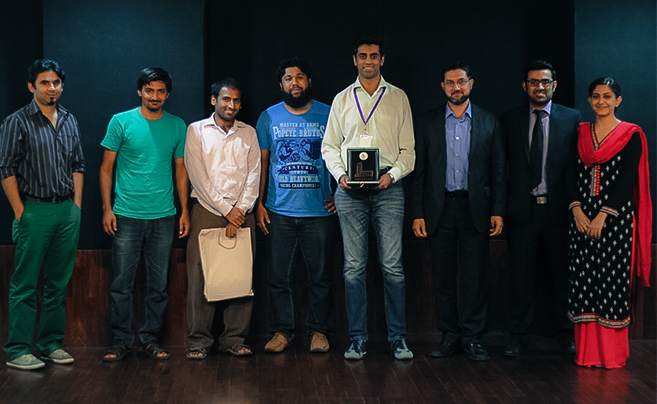 The six winning teams included: Do It Yourself Geeks, ActiveShehri, and E-Hostels for the Undeveloped category and Magisian, Market Eagle, and No-Tech Tap for the Developed category. The judges were highly impressed by the dedication and level of maturity in ideas displayed by the participant; they displayed great admiration for the efforts of the participants and their ability to be innovative and think outside the box. The shortlisted teams were also mentored extensively on idea-prototyping and business model preparation in one-on-one sessions by Mr. Tanzeel-ur-Rehman, Mr. Rehan Shay’kh and Dr. Adnan Noor. The competition not only helped participants channel their creative entrepreneurial ideas but also gave them a chance to run them by the experts in the industry. The nurturing of an entrepreneurial culture through education, research and extracurricular activities is one of the hallmarks of ITU’s educational philosophy, and the Tech Entrepreneurship Society is to be congratulated for pulling off this successful event. Share the post "ITU Entrepreneurship Weekend"